I had a very productive day today. I got my three Vargheists assembled and primed, possibly to paint tomorrow; I also bought and assembled the Altar of Evil, and by assembled, I mean "added a back to it, because the darn thing was hollow and the back was open." All I did was cut a rectangle of plastic from the packaging and glue it over the opening; it's the back, so it's not like anyone will really see it, but it would have bugged me to leave it open. I also got four figures painted today, though I'll only show you three of them now; I'll explain later why that is. First up, two test pieces for Kings of War; these will be a pair of Necromancers in play. "Satheras, Elf Warlock" and "Strumpet" are both Reaper Bones pieces. 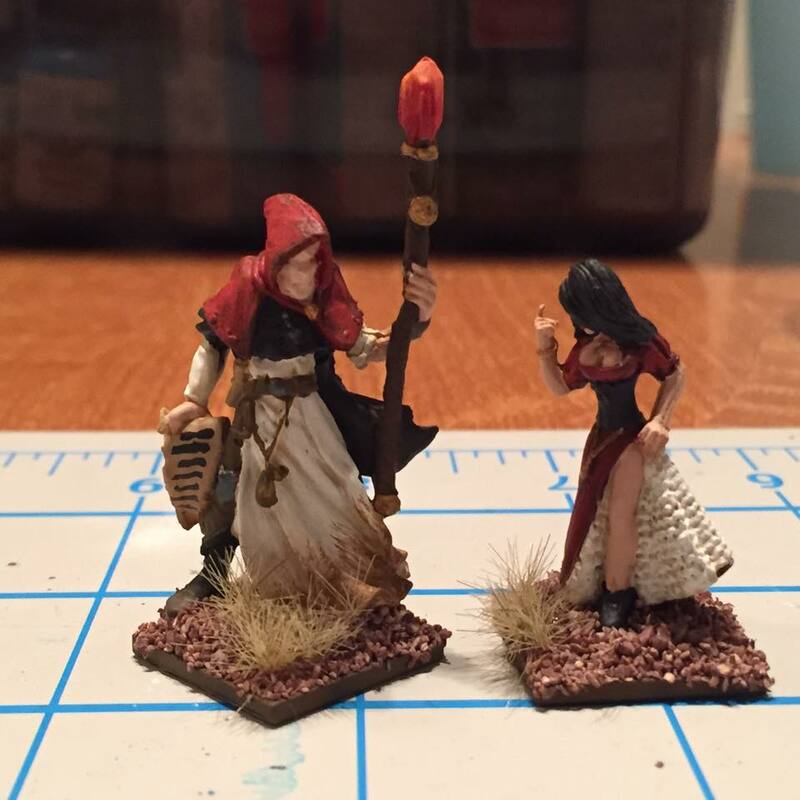 For my purposes, they are Bela and Erzebet, a bickering brother-and-sister pair of grave robbers and necromancers who aren't afraid to acquire fresh corpses by less friendly methods. I wanted to see how the dark red and off-white would look together before I started applying it en masse, and I'm pretty happy with the look here. I found the casting on Satheras/Bela's face to be a little soft; I may go back and try and pick out the detail with a wash.
Next up, Wargames Illustrated's "Flash Harry," a clear allusion to George MacDonald Fraser's unique Victorian antihero Harry Flashman; I found the detail on the face a bit light again - I'll go back and try to pick out the eyes later. This is a Christmas present for my father, who is as fanatical a Flashman fan as I am; I introduced him to the series years ago and he immediately went out and bought the entire series, with the intent to read them in chronological order - including splitting up "Flash and the Redskins" as it's narrative is split between two points in time. While the sculpt (and the paint job on Wargames Illustrated's website) are clearly based on Roddy McDowall in the film adaptation of "Royal Flash," I've opted to paint him with the black hair and whiskers described in Fraser's novels. And I've just now realized that what I've painted as cavalry gloves are in fact cuffs and bare hands. So I'll be going back and fixing that! 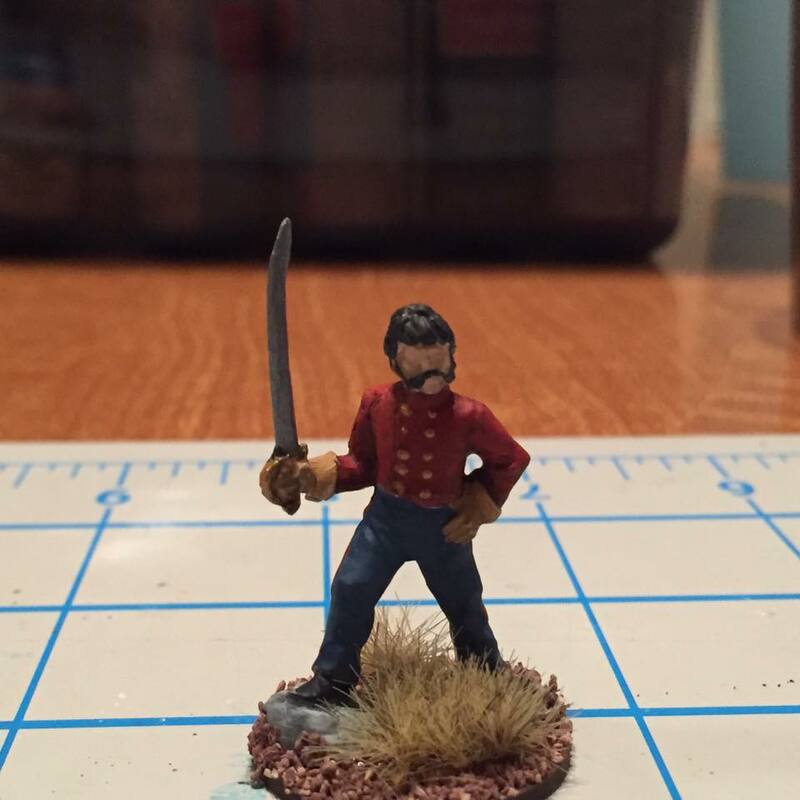 The fourth figure I painted today is another one in Wargames Illustrated's "Giants in Miniature" line, but as I painted it as a gift for someone who may occasionally read my blog, I won't be posting it here until after they've received it. You certainly have been productive, now thinking I should have painted my Flash Harry with dark hair though. Hobby Shop Recommendations in London/Leeds/York?